A contemporary patchwork blanket for babies featuring bold aeroplane motifs. Beautiful handmade knitted baby blanket, incorporating 12 individually knitted squares featuring aeroplane motifs and variety of stripes. Knitted in royal blue, orange, pale green, grey, cream and taupe. 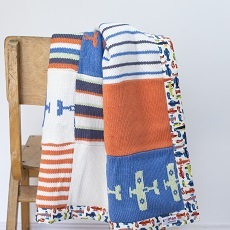 This patchwork blanket is backed with a fun aeroplanes printed fabric. All Smitten patchwork blankets are lightly wadded for extra comfort. This patchwork blanket has been created using Smitten’s distinctive style; combining knitted and woven textures, to provide a contemporary edge to traditional baby essentials. Smitten knitted baby blankets are approximately 65cm width x 70cm height. Perfectly sized for use in the Moses basket, cot or out and about in the pram.